Miss & Mister Grand Azerbaijan 2019 is back again with new announcement. 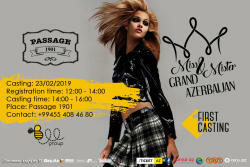 The first audition for the beauty contest will be held at Passage 1901 on February 23. Registration will take place from 12.00 to 14.00, Trend Life reported. Height requirements remain at a minimum of 165 cm (women) and 1.80 cm (men). All participants should meet modeling requirements, have an experience in the fashion-industry. Some 20 men and women will be selected to the semi-final. Contestants need to come at a specified time with an identity card. The attendance fee : 10 AZN ($ 9). The official opening of the competition will be held in Enerji Club this March. The final night will take place in Elektra Events Hall.